What Actually Happens in the Lotus Sutra? In his book, The Lotus Sutra: A Biography, Donald S. Lopez, Jr. unpacks what may be the most famous of Buddhist scriptures, explaining how it came to be and how its influence has grown over centuries. Here, Lopez provides what he calls “The Plot Summary” of the Lotus Sutra. Whether you’re experienced with the Lotus or have never endeavored to read it, you’ll have a deeper understanding of it. The Lotus Sūtra begins, like so many Buddhist sūtras, with the Buddha seated on Vulture Peak. He is surrounded by a huge audience of monks, nuns, and deities, many of whom are named; those names include the most famous figures of the tradition. Also present is a huge audience of bodhisattvas. This immediately indicates that this is a Mahāyāna sūtra, where the bodhisattva—one who has vowed to follow the long path to buddhahood—is extolled over the arhat, the ideal of the early Buddhist tradition, who follows a much shorter path to nirvāṇa. The Buddha delivers a discourse, whose content is not described, and then enters a state of deep meditation. He emits a ray of light from between his eyes, illuminating all the realms to the east, from the highest heavens to the lowest hells. One of the bodhisattvas in the audience—Mañjuśrī, the bodhisattva of wisdom—reports that he once witnessed the same miracle in the far distant past, after which the Buddha of that age taught the Lotus Sūtra. He thus speculates that Śākyamuni, the Buddha of the present age, is about to do the same. The Buddha now speaks, praising the wisdom of the buddhas, which he describes as superior to that of those who follow the path of the śrāvaka (disciple) or pratyekabuddha (privately enlightened) to become arhats. He goes on to say that he has taught the dharma using skillful means (upāya) in order that the beings of the world might overcome attachment. He addresses this statement to one of the arhats in the audience, indeed, the wisest of the arhats, the monk Śāriputra. The Buddha’s statement is disconcerting to Śāriputra; as an arhat, he is “one who has nothing further to learn.” And yet the Buddha is praising a wisdom beyond his comprehension and using a term—skillful means—that he had not heard before. In the past, the Buddha had taught three paths or “vehicles. […] However, those paths were skillful means. In fact, there is only one path, one vehicle: the path to buddhahood, the buddha vehicle. The Buddha eventually agrees to explain what he has said, but before he can do so, five thousand members of the audience get up and walk out—a remarkable moment in a Buddhist text. Describing them as arrogant, the Buddha announces that he is now about to teach the “true dharma,” the saddharma, which forms the first word in the Sanskrit title of the sūtra. He explains that the buddhas appear in the world for one reason: to lead beings to buddhahood. In the past, he had taught three paths or “vehicles” (yāna): the path of the śrāvaka that leads to the nirvāṇa of the arhat, the path of the pratyekabuddha that leads to the nirvāṇa of the arhat, and the path of the rare bodhisattva that leads to the distant state of buddhahood. However, those paths were skillful means. In fact, there is only one path, one vehicle (ekayāna): the path to buddhahood, the buddha vehicle (buddhayāna). He explains that if he had revealed this single path from the beginning, many would have felt incapable of following it. Therefore, he devised a skillful method to accommodate them, teaching a shorter and simpler path, the path to the nirvāṇa of the arhat. Now, he is revealing that there is only one path and that that path is available to all. 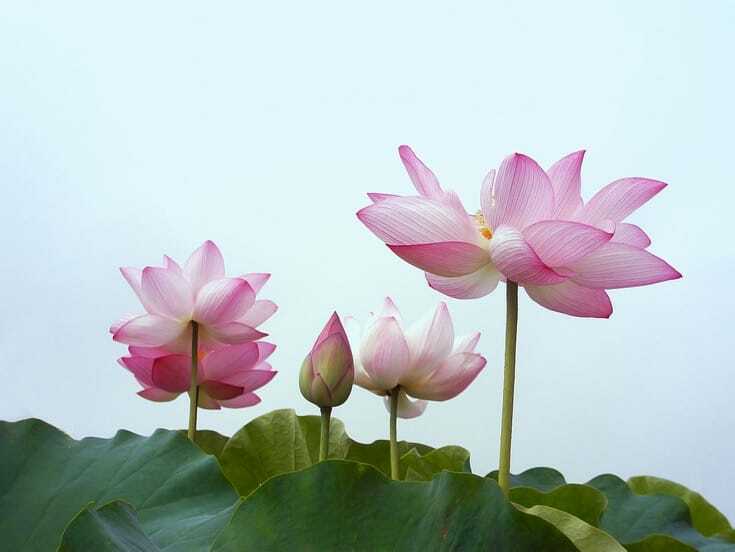 The Lotus Sūtra is famous for its seven parables (or eight in some versions). Four will be discussed here. The first and most famous is the parable of the burning house in Chapter Three. The house of a kind father catches on fire while his children are playing inside. When they ignore their father’s pleas to escape, he tells them that outside the house there are three carts awaiting them: one pulled by a sheep; one, by a deer; and one, by an ox. This promise causes the children to leave the house, where they find a single cart, drawn by an ox. The Buddha explains that the burning house is saṃsāra, the realm of rebirth; he is the father, and the children are the sentient beings of the universe, so absorbed in the world that they ignore its dangers. Knowing the predilections and capacities of sentient beings, the Buddha lures them to various paths to escape saṃsāra by offering them something that appeals to their limited aspirations. However, this is his skillful method. When they have set out on that path, or even reached its final destination, he reveals that there is only one path and one goal, far superior to what he had taught before: the single vehicle to buddhahood. The Buddha explains that the burning house is saṃsāra, the realm of rebirth; he is the father, and the children are the sentient beings of the universe, so absorbed in the world that they ignore its dangers. This inspiring revelation is followed by a grim description of the fate that awaits those who reject the Lotus Sūtra and who disparage those who follow it. After they die, they will be reborn in hell, and when they are subsequently reborn as humans, they will suffer all manner of maladies. The Buddha’s revelation of the single vehicle causes the great arhats, beginning with Śāriputra, to request prophecies of their future buddhahood, something that all bodhisattvas must receive to proceed on the path to buddhahood. They explain that up until this point, they were unaware that they were worthy to follow that path, illustrating this with the parable of the prodigal son who leaves home, during which time his father amasses great wealth. When the son eventually returns, he feels unworthy to claim his birthright, and his father must employ a series of stratagems to convince him of his destiny. The Buddha’s skillful means are illustrated yet again with the parable of the conjured city. Here a group of travelers set out on a long journey in search of treasure, led by a guide. They become discouraged along the way and decide to turn back, but the guide tells them that there is a city just ahead. After they have rested in the city and regained their resolve, the guide tells them that he had conjured the city and that the treasure lies ahead. Here, the Buddha is the guide, and the treasure is buddhahood. If the Buddha had explained from the outset how long the path to buddhahood was, many would not seek it. 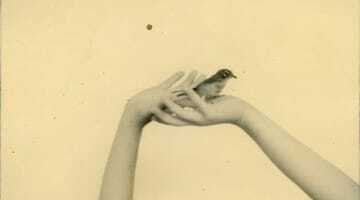 He therefore inspires beings to seek the nirvāṇa of the arhat. Yet, when they reach it, he explains that it is an illusion and that the true goal lies ahead. Woven throughout the sūtra are what might be called strategies of legitimation. The Buddha recounts numerous stories from the far distant past, before past events described in the earlier tradition. These accounts describe the Lotus Sūtra being taught long ago in distant universes, with the members of the ancient audience, including the Buddha while he was a bodhisattva, now appearing in the present. If the Lotus Sūtra was taught long ago, it cannot be a modern innovation, something that Buddhism has traditionally condemned. Also found throughout the sūtra are various prophecies and promises of the glories that await the devotees of the Lotus, even if that devotion takes such simple forms as reciting a single verse of the sūtra, offering flowers to the text, or just joining one’s hands in reverence. Those beneficent admonitions are sometimes paired with warnings, and not only of the fate that awaits those who fail to acknowledge that the Lotus Sūtra is the word of the Buddha. In Chapter Ten, for example, the Buddha warns that devotees of the Lotus will face mockery and disparagement after he has passed into nirvāṇa. 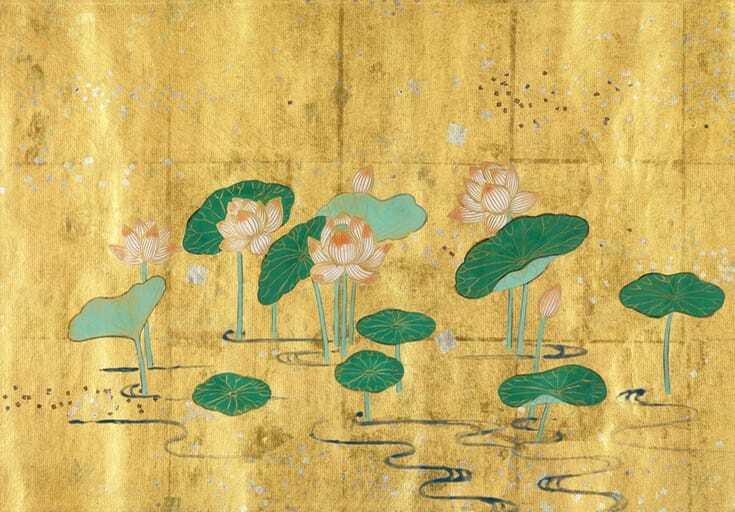 From the cover of “The Lotus Sutra: A Biography,” an illustration of the Lotus Sutra from a handscroll, c. 1257. Chapter Eleven contains one of the most fantastic (in the original sense of that word) scenes in Buddhist literature. The traditional structure that houses the relics of the Buddha is the stūpa (from which the English word tope derives), a large mound. According to the traditional account of his final days, the Buddha instructed his disciples to cremate his body and place his remains in a stūpa. Over the course of the history of Buddhism in India, such reliquaries became increasingly elaborate, taking the form of the pagoda in East Asia and the chedi in Thailand. As the chapter opens, a massive stūpa, miles high and miles wide, emerges from the earth and floats in the air above the assembly. A voice inside is heard praising the Lotus Sūtra. At the request of his disciples, the Buddha rises into the air and opens the door of the stūpa to reveal not relics but a living buddha, named Prabhūtaratna, who explains that he vowed long ago that after his passage into nirvāṇa, wherever the Lotus Sūtra is taught, his stūpa would appear there. He then invites the Buddha to sit beside him. This image of two buddhas seated side by side inside a stūpa would be widely depicted in Buddhist art over the centuries. Among the doctrinal revelations that this scene intimates is that a buddha does not die after he passes into nirvāṇa. 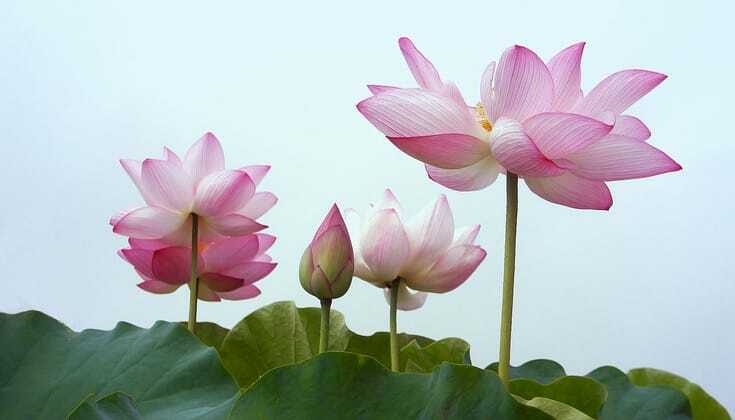 Women play minor roles in the Lotus. Among the many arhats to whom the Buddha offers prophecies of future buddhahood are two nuns: his stepmother, Mahāprajāpatī, and his wife, Yaśodharā. The most famous scene involving a female occurs in Chapter Twelve, in which the bodhisattva Mañjuśrī introduces an eight-year-old nāga princess (often depicted as half human, half snake) and says that she will attain buddhahood. When Śāriputra disputes this, saying that women have five obstructions that prevent their attainment of buddhahood, the nāga princess instantaneously achieves buddhahood, but only after first turning into a male. Billions of bodhisattva had arrived from other universes to witness the stūpa that emerged from the earth. 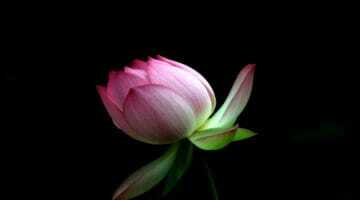 At the beginning of Chapter Fifteen, they volunteer to remain in this world to preserve and promote the Lotus after the Buddha has passed into nirvāṇa. 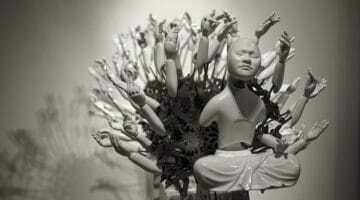 The Buddha politely declines, saying that there are sufficient bodhisattvas from his own world for the task. At that point, another remarkable scene occurs, as billions of golden bodhisattvas emerge from beneath the earth. When the bodhisattva Maitreya asks who these bodhisattvas are, the Buddha explains that they are his disciples, whom he placed on the path to buddhahood aeons ago. Maitreya is puzzled by this because he knows that the Buddha only achieved enlightenment forty years ago. The remainder of the sūtra is devoted to enumerating the many benefits that await those who honor the Lotus Sūtra and the sad fate that awaits those who disparage it. Although the sūtra has twenty-eight chapters, it appears to end with Chapter Twenty-Two, when the Buddha exhorts his disciples to spread the teaching, after which they return to their abodes. As will be discussed in the next chapter, scholars speculate that this was the final chapter of an earlier version of the Lotus, with the last six chapters being interpolations. Several of those chapters seem to be designed to promote the worship of bodhisattvas mentioned in early chapters, two of whom deserve special mention. The first is Bhaiṣajyarāja (Medicine King). The Buddha explains that as a bodhisattva in a previous life, he honored a previous buddha by ingesting oils, soaking his robes in oil, and setting himself on fire, with his body illuminating billions of worlds for twelve hundred years. As we shall see in chapter 3, monks in China would follow his example, their bodies burning for considerably shorter periods. Although Chapter Twenty-Five is regarded as an interpolation, it is in many ways the most famous chapter in the Lotus Sūtra, widely memorized and circulated independently. It is devoted to the most famous bodhisattva in Buddhism, Avalokiteśvara: the “Lord Who Looks Down” in Sanskrit, rendered as the “Perceiver of the Sounds of the World” in Chinese, with both versions of the name suggesting his compassion in responding to those in need. Here, the salvation that he offers is not only spiritual but also physical, rescuing those who are drowning, attacked by demons, beset by bandits, and thrown in prison. If a woman is childless, he will provide a child. This bodhisattva has the power to appear in any form. As we shall see in chapter 3, there are many stories of Avalokiteśvara disguising himself to benefit those in need. Excerpted from The Lotus Sutra: A Biography by Donald S. Lopez, Jr. © 2016 by Princeton University Press. Reprinted by permission. About Donald S. Lopez Jr.
Donald S. Lopez, Jr. is the Arthur E. Link Distinguished University Professor of Buddhist and Tibetan Studies at the University of Michigan. His books include The Princeton Dictionary of Buddhism (with Robert E. Buswell, Jr.), The Tibetan Book of the Dead: A Biography, and The Lotus Sutra: A Biography. He lives in Ann Abor, Michigan.